Are you losing sleep because of debt? Are you wasting money on finance charges and feel like you can’t get ahead? With an aggressive debt-reduction plan and persistence, you can wipe out that debt — sooner than you might imagine. List all your credit-card debtors. To get a clear picture, list them in order of highest interest rate first. List the current balances on each of these accounts. You can get this information on your monthly statement. List the minimum required monthly payment for each account. Do this even if you usually pay more. Total the minimum required monthly payments. This tells you how much you have to pay each month. Enter the total amount you have available each month to apply toward your debt-reduction plan. 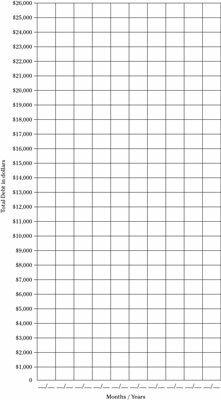 This is income you have left over after necessities like food and housing. Generally, it’s wise to apply only the required minimum payment to each credit card other than the one with the highest interest rate. However, you need to consider other factors as well. One of the most important factors is how the amount of debt on a card compares to the available credit on that card. A high debt balance to available credit ratio really hurts your credit score. Focus on maintaining no more than a 30 percent balance to available credit on any card. Pay down the high interest credit cards most aggressively and focus on reducing debt ratios if the interest rates are fairly similar. Record actual payments made and date of payment in the far right column. Just listing all of your debt and seeing how much you can pay helps you assess your situation. 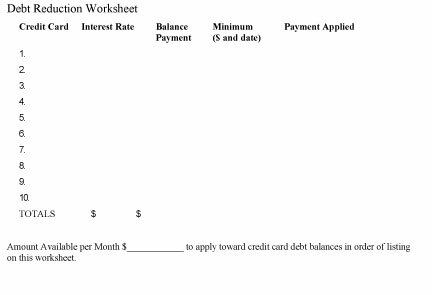 Click here to download and print the Debt Reduction worksheet. Click here to download and print the Debt Reduction Progress Log.